Correct Shock & Strut Kit for Stock 2003 Mach1 ? Community Q&A Question: Correct Shock & Strut Kit for Stock 2003 Mach1 ? I want to replace the shocks & struts on my "stock" 2003 Mach1. Despite the optimum conditions (dark, raining, no jack & parked on a busy street) I wasn't able to figure out which is the "right" shock & strut kit for my car. The "quad shock" kit (item # KYB-235060A-K) or this kit (#KYB-235060B-K) ? Thanks ! Both kits will work on your application. The first part number you referenced also includes the rear quad shocks which help prevent wheel hop. 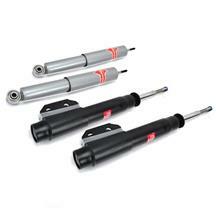 If the car has a lot of miles on it, it is recommended to replace those quad shocks as well. If your quad shocks are still functioning and you are not experiencing any wheel hop, the second part number you referenced does strictly the shocks and struts, and omits the rear quad shocks.